Early morning practice means grabbing something quick and light before heading to the locker room. 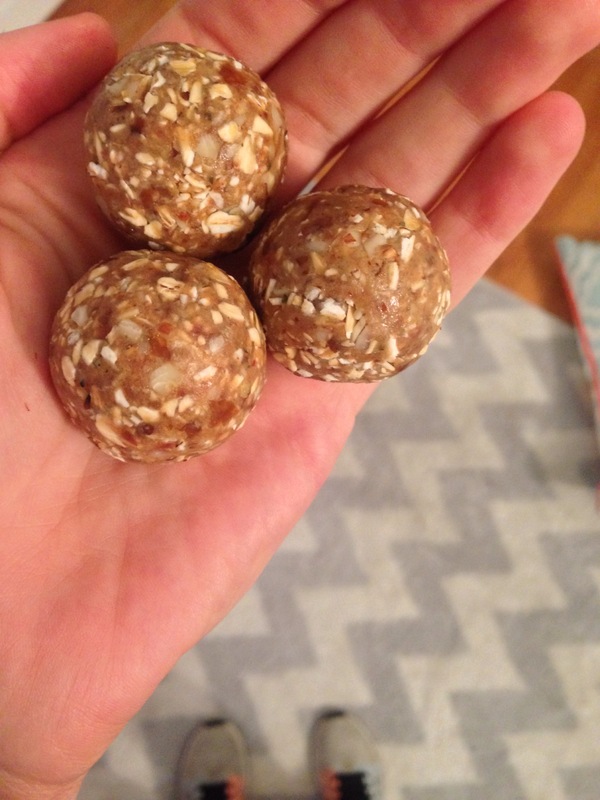 Earlier this week I made these energy bites and they’ve been a great preworkout snack! It’s a super basic recipe and really customizable depending on what you have on hand and what you want them to taste like. I made this batch with medjool dates, rolled oats, NutZo (nut butter) and chia seeds. I’ve also made the before with other ingredients like hemp seeds, goji berries, cocao powder, cinnamon, vanilla extract, tahini and coconut! To make them you put unpitted medjool dates (i used 8) in a food processor and pulse until they become gooey/pastey (you might need to soak the dates in hot water before all of this if they arent soft enough). Then throw in the rest of your ingredients and pulse until it forms a doughy texture. Then you can roll the dough into bite sized balls and store them in the fridge for on the go fuel!